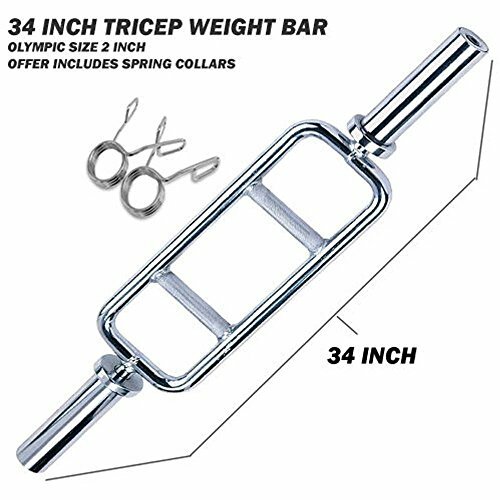 Strengthen your upper arms with this Fitness Maniac Barbell Olympic Triceps Bar. It is designed with ergonomic hand-grips that allow unrestricted movement during lifts. This Fitness Maniac Barbell workout bar is specifically engineered for optimal concentration of the triceps without discomfort to your elbows, wrists or forearms. It has sturdy solid steel construction and a chrome finish. Bar is designed for maximum concentration of the triceps muscle without the discomfort to your elbows, wrists or forearms. Ergonomic handgrips and revolving sleeves for unrestricted movement. Designed to accept conventional Olympic-sized plates (2 Inches). Diamond-knurled handgrips and rotating sleeves, ensuring maximum comfort and safety.